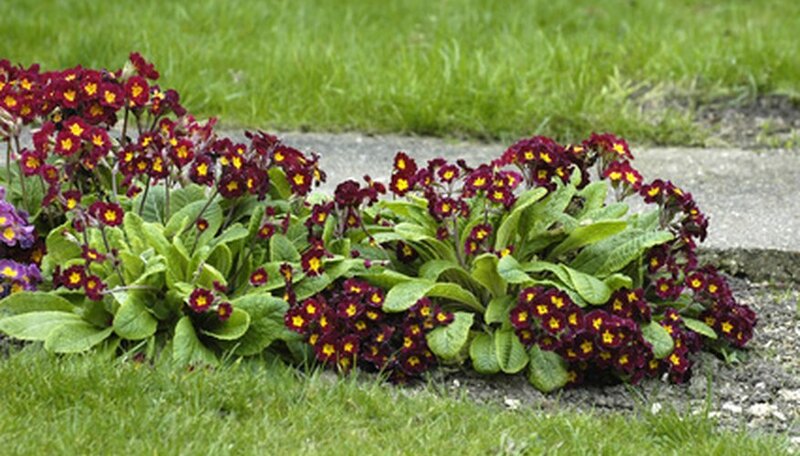 Flower beds are created every year with annuals or a mixture of annual and perennial flower choices. No matter what type of flower bed you are putting in, the first thing to consider is the type of plants you will include. Most annuals require a full-sun location, while there are perennials that do well, or even prefer, partial shade. Be sure to choose the right plants at the nursery that will flourish with the natural amount of sun your flower beds receive. Amend your soil. Compost will change sandy soil to hold more water and clay soil to drain more water. It also adds nutrients to the soil needed by new flower plants. Start by digging up the area, a foot down, where the flower bed will reside. Loosen and break up the dirt, removing any roots, weeds, rocks or other debris. Pour about a 2-inch layer of organic compost onto the top of the flower bed and work it in to the ground soil. Rake the soil even. Place your plants, where they will be planted, on the amended soil bed. This gives you a chance to arrange and rearrange the plants before you start putting them in. Dig holes and plant the flowers one at a time. Remove the plant from the nursery container. Dig a whole the same height and just slightly larger than the root ball. Place the plant into the hole and push soil around the roots. Press gently on the top of the soil to remove any air pockets. Repeat this process for each plant. Water the entire flower bed, but not so much that you create mud.